When we were in college, David and I were hanging out with our friend Les one night. We had the TV turned onto 20/20 or Dateline (because that’s how we rolled in college… and now… we’re boring) and they were doing a story about pet boa constrictors that people release into the wild once they get too big. In this particular profile, they were interviewing an older lady who had lost her prized poodle to one of these giant snakes. There was one particularly chilling moment when the woman is describing her precious pup barking something at the back door. Then the lady turns to the man doing the interview and comments, “And then the snake came.” It was a terrible story. This poor lady lost her companion to a snake that some lout let loose into the everglades because he couldn’t (or, more likely, didn’t want to) care for it anymore. Well, the above story has absolutely nothing to do with my story, other than the fact that they both involve snakes; really big scary snakes. I’m a little like Indiana Jones in that I’m terrified of snakes. I hate, hate, hate them. Thankfully I’ve had very few run-ins with serpents of any kind. Last night, however, one was way too close for comfort. The boys spent all day yesterday with my mom. David and I went over after work and I was just starting to make dinner. Our oldest was insistent that David come out to the swing set to see his rock collection. 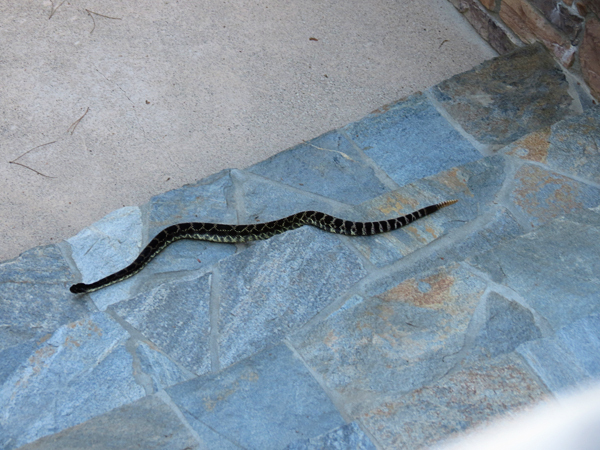 David was about to step outside with both boys when something on the steps, right outside the back door, caught his eye. It was big and it slithered. David herded the boys inside because, not only is he afraid of snakes, he couldn’t see if this particular snake had a rattle or not. We made our way to the upstairs balcony to check and, sure enough, it did. I stayed up on the balcony with the boys while my mom called animal control and David made his way outside (via a door on the other end of the house) so that he could keep an eye on the snake. As the snake disappeared from view on my end, David kept an eye on it. 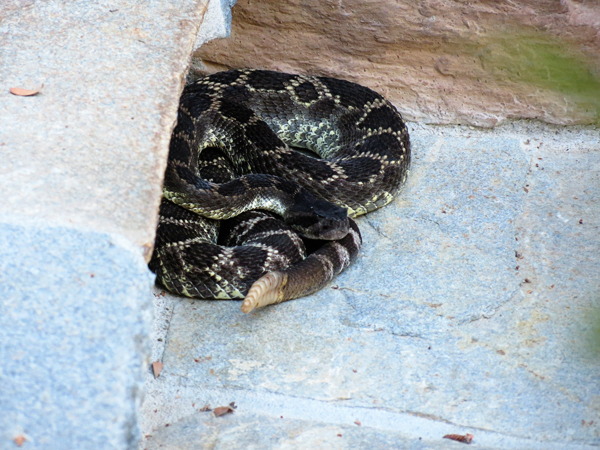 It actually curled up to take a nap right against the step so that you could not see it from the house. Had we not known it was there, we could have easily walked out and been ambushed on our way to the pool. There is no way you would have seen it in time. The wait for animal control was agonizing. It was getting darker by the minute and David was seriously contemplating trying to kill the snake if it tried to make a move. I was not on board with this plan and was praying for animal control to arrive sooner, rather than later. I watched as the truck pulled down the street and then proceeded to pass the house going in the wrong direction. In an instant, I realized that they were leaving so I did the only logical thing: I sprinted down the street as fast as I could (completely barefoot, by the way) doing my best Usain Bolt impression (I like to think that I was Bolt-like, but in reality I was screaming and waving my arms like a lunatic so I probably appeared less Usain and more insane). Thankfully, I caught up with them at the end of the street and convinced them to turn around (they had the wrong address written down). It only took them a few minutes to capture the snake, but not without incident (not only did they royally tick it off, they also managed to lose control and drop it before finally ushering it into a wooden box). I have never heard anything rattle that loudly. It didn’t even sound real. Needless to say, I am thankful that this whole snake ordeal is over and that no one was hurt (the outcome could have been very different and we were very blessed to be kept safe). 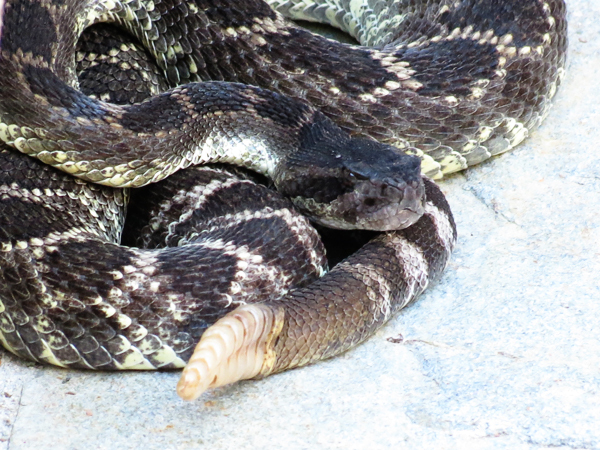 I can say for certain that I will never go outside again without checking every possible angle to make sure I’m not walking straight into a napping rattle snake.